In this year the jury was surprisingly at one with the audience for the awarding of the prize. For his text – which, by way of exception, was able to score with humour – Tilman Rammstedt received the Ingeborg Bachmann Prize and the audience award. As usual, the main prize of the event is the 25,000 € Ingeborg Bachmann Prize. This prize is sponsored by the regional capital city of Klagenfurt. 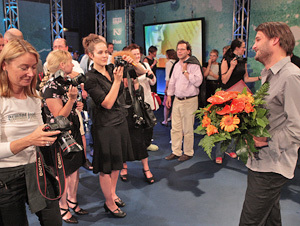 Once it was determined that Rammstedt had won the prize, he was surrounded by photographers. It took three rounds of voting to award the Ingeborg Bachmann Prize, which is worth 25,000 Euros. Patrick Findeis received three votes in the first round, Orths and Rammstedt two each. Following the run-off vote between the two second-placed, Tilman was finally able to enjoy having won this year's Bachmann Prize. Gert Jonke (1977), Ulrich Plenzdorf (1978), Gert Hofmann (1979), Sten Nadolny (1980), Urs Jaeggi (1981), Jürg Amann (1982), Friederike Roth (1983), Erica Pedretti (1984), Hermann Burger (1985), Katja Lange-Müller (1986), Uwe Saeger (1987), Angela Krauß (1988), Wolfgang Hilbig (1989), Birgit Vanderbeke (1990), Emine Sevgi Özdamar (1991), Alissa Walser (1992), Kurt Drawert (1993), Reto Hänny (1994), Franzobel (1995), Jan Peter Bremer (1996), Norbert Niemann (1997), Sibylle Lewitscharoff (1998), Terézia Mora (1999), Georg Klein (2000), Michael Lentz (2001), Peter Glaser (2002). Inka Parei (2003), Uwe Tellkamp (2004), Thomas Lang (2005), Kathrin Passig (2006) und Lutz Seiler (2007).